Little Baby Chickens, two weeks old, how do you like the world so far? One jumps up, and then they all go! This is so much fun. They are 2-weeks old now and growing like gang-busters. 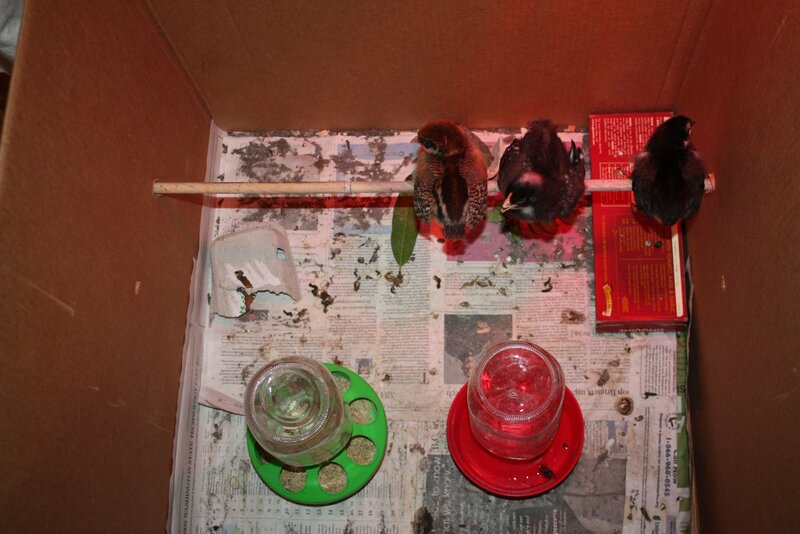 Still in the den, but we’ve set them up in a bigger box. The littlest one had been trying to fly but it was the biggest one who started jumping up onto the ‘water tower’, so I ran a piece of bamboo through the box to see if they’d roost on it and they did! Other firsts this week: dust-bathing! When my sprinkling of diatomaceous earth resulted in a pile of the powder, instinct triggered the two biggest chicks to roll around in it flapping their wings. This was very cute for a little while, but when they still weren’t getting up after 20 min we began to freak out that they might be having an acute toxic reaction to it! Scott was calling hotlines and scanning the internet (man of action) while I just watched them, then took them out of the box and held them. Eventually they stood up and were fine, and we could laugh about our nascent experience of feeling like anxious parents! We also fed them bugs for the first time. We were outside cleaning up plant clippings from the walkway which revealed a handful of worms et al. I picked them up, dropped them in the chicken box and we stood back to watch. The chickies were very observant for a moment. 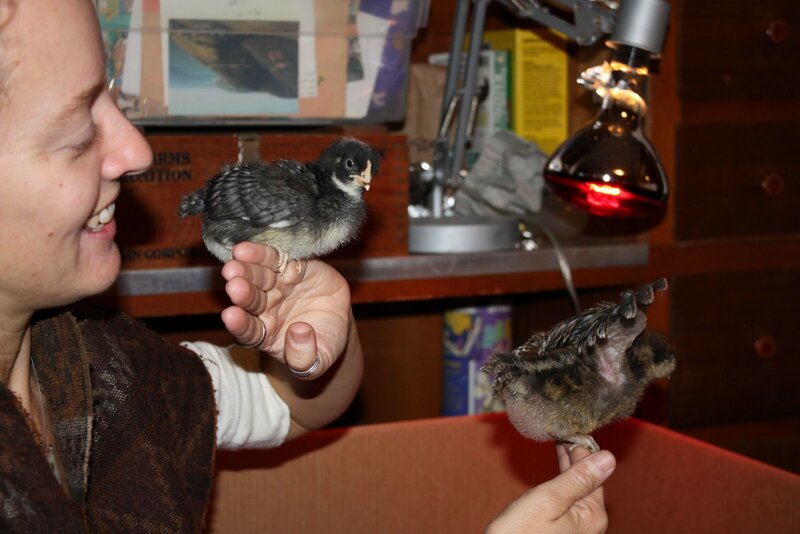 Our feather-faced Ameraucana approached the shell-backed pillbug and experimental pecked at it. It jolted away from her and she ran shrieking, literally, like a little girl! It was hilarious. 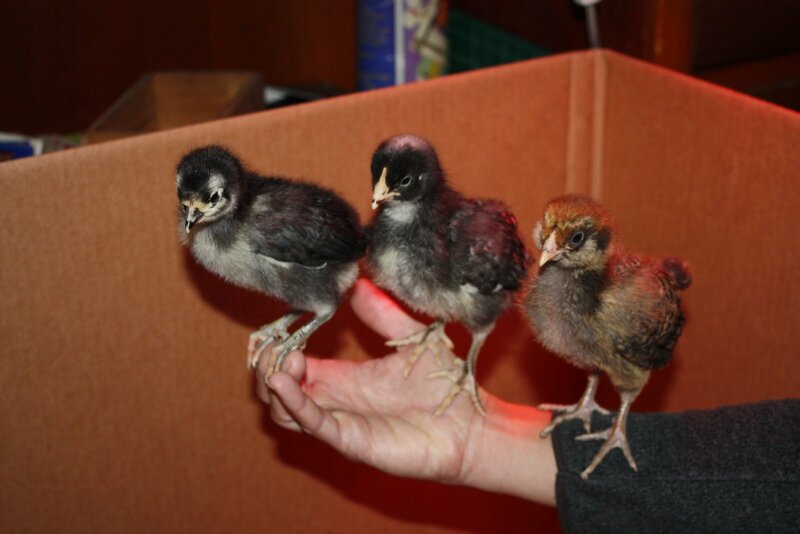 Our smart little Australorp caught on first and raced around the box with little prizes for a minute before the others joined in. Within 5 minutes, they had successfully devoured their first real meal. We are proud of their instincts! The little girls will walk onto our hands now and sit down. 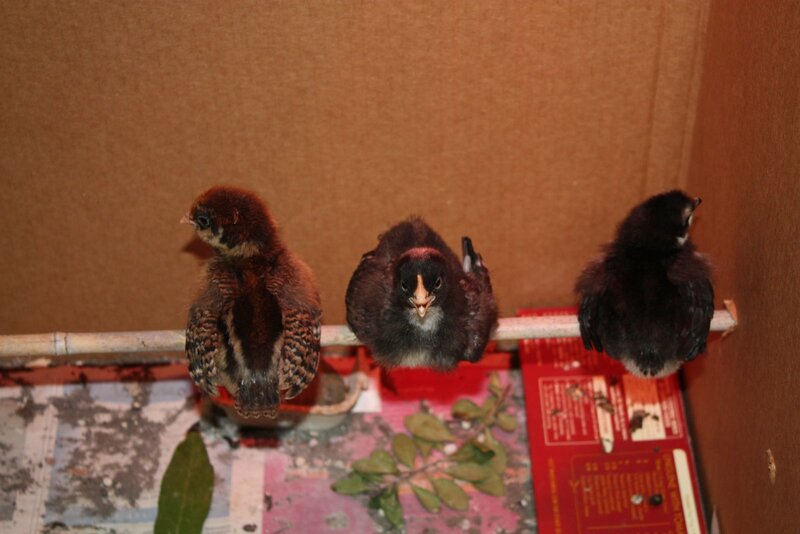 They are all three growing tail feathers. Rocky’s rapidly emerging comb is worrying me that she’s a cocky little ‘girl’ instead of a Rockette. Time will tell. They still freak out when you make sudden moves or loud noises, like last night when Scott sneezed – but, hey – they’re chickens! This entry was posted in baby chickens, bugs. Bookmark the permalink. 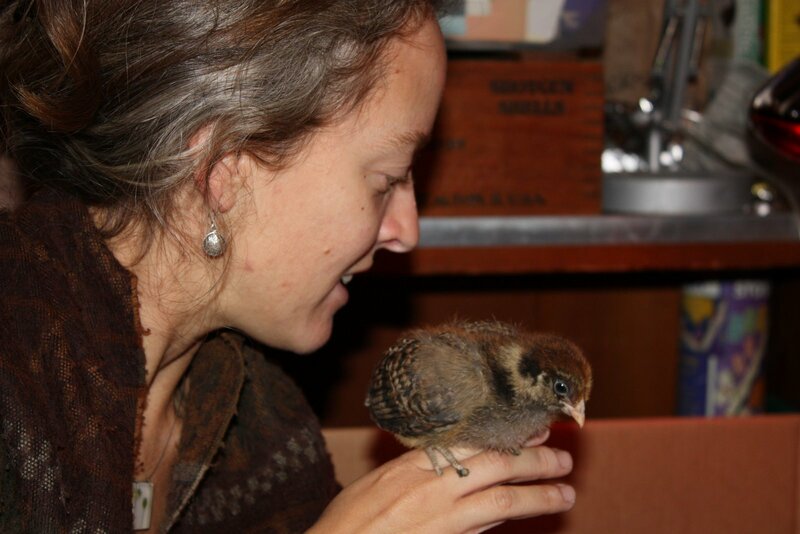 5 Responses to Little Baby Chickens, two weeks old, how do you like the world so far? you can buy any amount of d.e. from earthworks.com go to there site or type in earhtworks health.com review their testimonials both human and pet ,you will be amazed!!! The food grade and the regular de is the same just different priced. .